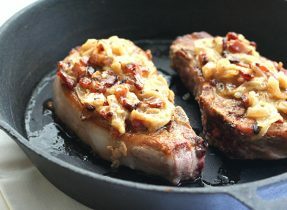 Juicy, tender pork chops smothered in a creamy onion and bacon sauce. This might be the best low carb meal I’ve ever had! In a large saute pan, cook bacon over medium heat until crisp. Use a slotted spoon to remove to a bowl, reserving bacon grease. Add onions to bacon grease and sprinkle with salt and pepper. Cook, stirring frequently, for 15 to 20 minutes, until onions are soft and golden brown. Add onions to bacon in the bowl. Increase heat to medium high and sprinkle pork chops with salt and pepper. Add chops to pan and brown on the first side 3 minutes. Then turn chops over and reduce heat to medium, cooking on the second side until internal temperature reaches 135F, about 7 to 10 more minutes. Remove to a platter and tent with foil. Add broth to pan and scrape up any browned bits. Add cream and simmer until mixture is thickened, 2 or 3 minutes. Return onions and bacon to pan and stir to combine. Top pork chops with onion and bacon mixture and serve.